The Tannheim Valley is approx. 220 km away from Stuttgart. You travel down the A7 until you reach the exit Oy-Mittelberg, follow the B310 heading to Wertach/Oberjoch (here you branch off towards Jungholz), in Oberjoch turn left in the direction of Tannheim Valley. 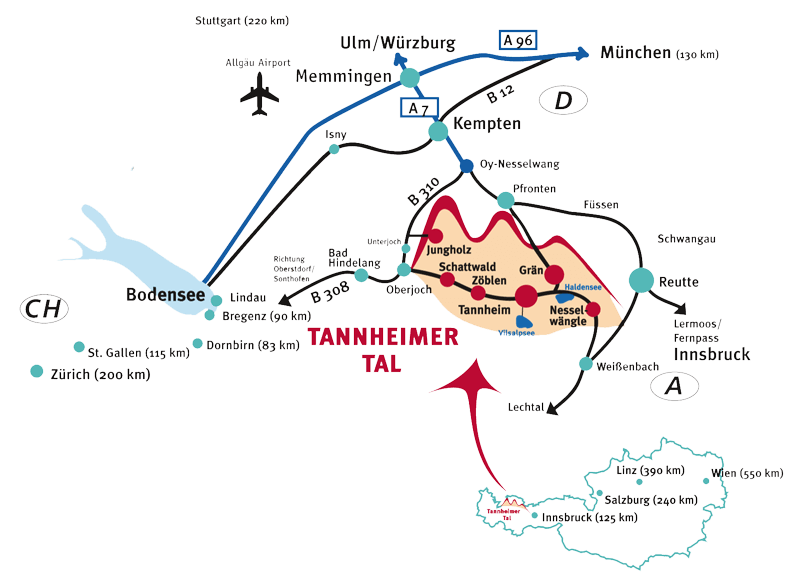 Alternatively, take the A7 exit Oy-Mittelberg – Nesselwang, Pfronten – this road will take you to Grän in Tannheim Valley. From Switzerland (St. Gallen is approx. 115 km away) your journey will take you through the Lake Constance region and along the B12 (Lindau, Isny in Allgäu and Kempten) to the A7. Continue as described above. The nearest airport is in Memmingen (Allgäu Airport) and is a 45-minute drive from here.